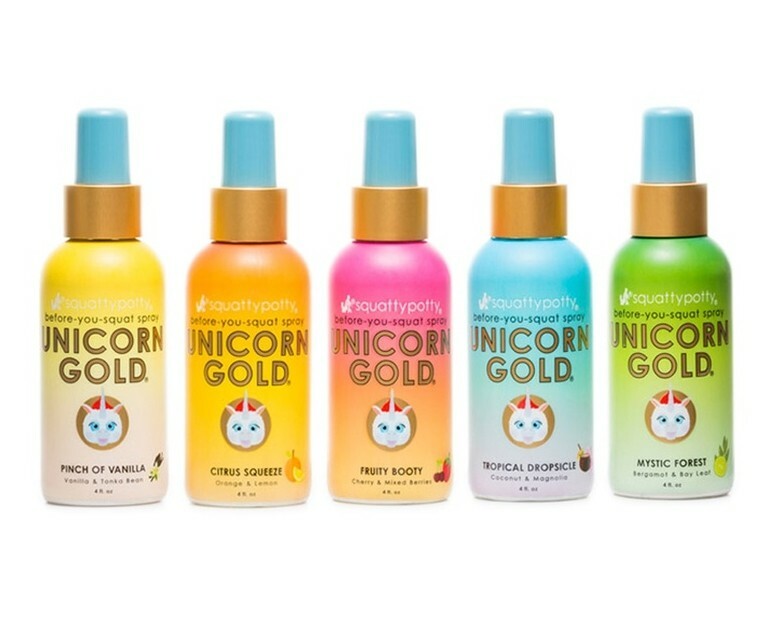 Unicorn Gold is for before you sit on the toilet. Created by Squatty Potty Unicorns. Let rip a few sprays into the toilet bowl before 'the event' and forget that bathroom stench forever. It stays trapped deep below the surface of the toilet water, never to surface again. If UNICORN poop is like ice cream then this stuff is like a UNICORN fart. Lovers, your partner will love you all the more for being 'so considerate' if you know what we mean. Unicorn Gold magically turns your “business” into nothing more than a stroll to the end of a freshly-fallen rainbow. Non toxic formula that includes real gold nanoparticles and essential oils that trap smells well below the surface. Available in five refreshing scents. Tropical Dropsicle– Coconut & Magnolia. Mystic Forest– Bergamot & Bay Leaf. Pinch of Vanilla– Vanilla & Tonka Bean. Citrus Squeeze– Orange & Lemon. Fruity Booty™– Cherry & Mixed Berry.